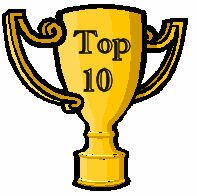 Several years ago I wrote Top 10: American History Facts. It has been a very popular post the last couple of weeks. Thought I would add a second installment. #10: The Red Cross has a Congressional charter even though it isn’t a government agency. It was chartered in 1990 to provide disaster relief and provide assistance to the military families. #9: President James Madison was the 1st graduate student at Princeton University. #7: The seven rays on the Statue of Liberty’s crown represent the seven continents. #6: The Texas Capitol is 15 feet taller than the U.S. Capitol. #5: Hawaii is the only state in the U.S. where coffee is grown. #4:JFK was a huge James Bond fan. #3: Alaska has a longer coast line than all other states combined. #2: The Adelsverin or Society for the Protection of German Immigrants in Texas was created in 1842 to promote a mass immigration movement to the Republic of Texas and create a new German state in America. The society encountered many difficulties and internal conflict but about 7,000 Germans immigrated before the society folded in 1847. #1: The 50-Star was designed by Robert G. Heft created the design as a class project. He was originally given a grade of B-. After the flag was adopted by Congress his grade was changed to an A.